What is an elliptical clause? What is an adverb clause? An elliptical clause is a type of clause that has implied words. 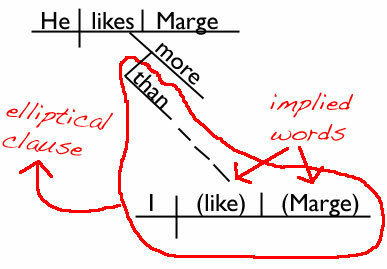 The majority of elliptical clauses are dependent adverb clauses. Do you remember learning about those? Don't fret if you don't remember. Here's a quick refresher on the important stuff. Clauses are groups of words with a subject and a verb. Subordinate clauses are clauses (groups of words with a subject and a verb) that don't express a complete thought. They act as one part of speech. Adverb clauses are subordinate clauses that act as adverbs. What is an elliptical clause? What does it take for a group of words to be an elliptical clause? Well, there are two things that every elliptical clause must have. You can even use these as a short checklist to help you identify elliptical clauses out there in the world. 1) It must be a group of words with a subject and a verb. This makes it a clause. The subject and/or the verb may be implied. 2) It has one or more implied words. The subject might be implied, the verb might be implied, or another word might be implied. This makes it an elliptical clause! Now we're going to learn more about elliptical clauses with the help of two examples. He likes Marge more than I (like Marge). That example is made up of an independent clause and a subordinate clause. The independent clause is He likes Marge more, and the subordinate clause is than I (like Marge). We're not interested in the independent clause in this lesson, so we're just going to focus on the subordinate elliptical clause. The words than I (like Marge) are an elliptical clause. Is it a group of words with a subject and a verb? Yep! (subject = I, verb = like) This means it's a clause. Does it have implied words? Yep! (like Marge) This means it's an elliptical clause. This whole clause is acting as an adverb. Than I (like Marge) is modifying the adverb more. This means it's an elliptical adverb clause. 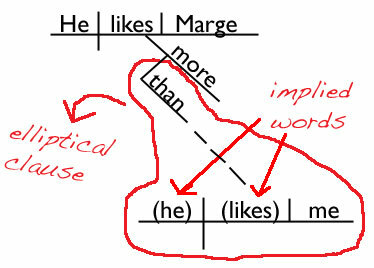 Check out this sentence diagram, and you can see how to diagram an elliptical clause. Put the implied words in parentheses. Notice that with the diagram, it's easy to tell that the subordinate elliptical clause is acting as an adverb modifying the adverb more. He likes Marge more than (he likes) me. Woah! Did you notice the giant change in meaning we have in this example from the first example, and we only changed one word?! Crazy, huh? The words than (he likes) me are an elliptical clause. Yep! (subject = he, verb = likes) This means it's a subordinate clause. Yep! (he likes) This means it's an elliptical clause. The whole clause is acting as an adverb. Than (he likes) me is modifying the adverb more. This means it's an elliptical adverb clause.